Of course I’m talking about meat, and the cooking of it. Here is a common dilemma I have faced in the past. I find a wonderful recipe for a flank steak on the grill. The recipe says cook 4 minutes on each side for medium rare. Sounds simple, right? First, say I want to buy a top round steak instead of flank because it’s cheaper and on sale. Second, I can’t “ask my butcher” to prepare the right size for me as the recipe suggests, because this is a grocery store and he would look at me funny. The top round I purchase is 2 pounds, 1 inch thick, and the recipe calls for 1 pound, ½ inch thick. If I follow the recipe, my meat will be medium raw, not medium rare. It’s the same issue for that recipe that calls for a 2 pound pork roast, but I have a 3 pound roast in the freezer. It’s a simple thing really, little grasshopper. Never cook your meats based on a specified length of time, but on the internal temperature reached in the thickest part of the meat. And how does one do this? This was my first meat thermometer. I hated it from the minute I brought it home. It’s heavy and clunky, falls over if you try to leave it in a thinner cut of meat, and you can’t see it through the oven door. And it takes for.ev.er to get to temperature. So you end up repeatedly opening the oven door to check the temperature of the meat, promptly reducing the oven temperature by about 100 degrees, and then you wonder why it takes 2 days to cook a 3 pound roast. If anyone wants it, I’ll send it to you. 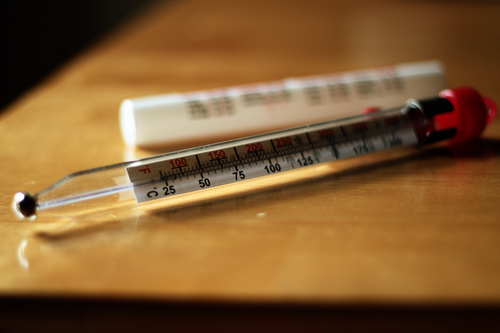 This is my baby, my Brad Pitt of the thermometer world. It’s nothing fancy; I got it on sale at Target (you can find it or something similar on Amazon). But it makes me a very happy girl. The working end goes into your meat of choice. I’ve tested it, and the sensitivity is in the first inch or so at the tip, so there is no need to ram the thing right through your piece of meat. But this is the best part: you insert it into the meat, set the temperature alarm for the internal temperature you are looking for, close the oven door, park the display on your stovetop…..and walk away. Oh heaven. And it works on the grill too! If I ever find out that Brad has gotten within 10 feet of the fish tank, I’m filing for divorce. Medium-rare 135°F Recommended (by me!). Medium-well 155°F Things start getting tough. Well-done 160°F Don’t go there. Have a burger instead. A note on resting: The larger the cut of meat, the more the internal temperature will rise on resting. 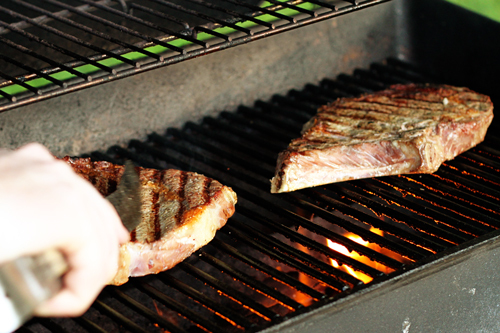 So if you have a thinner (less than ½ inch) steak, you will need to get it almost up to temperature when cooking. A 3 pound roast or whole bird can be taken off the heat at 5 to 10 degrees early, and will reach temperature while resting. 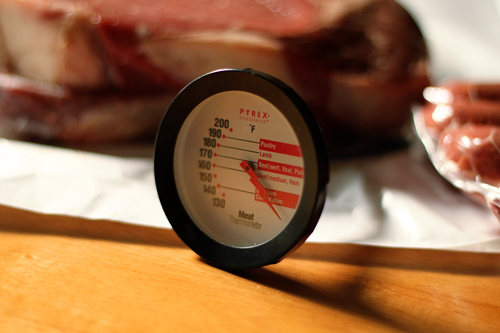 A note on “low and slow” for beef and pork: When cooking a brisket or a shoulder roast or ribs at a low temp 250°F to 300°F for a long time, I rarely use the thermometer. 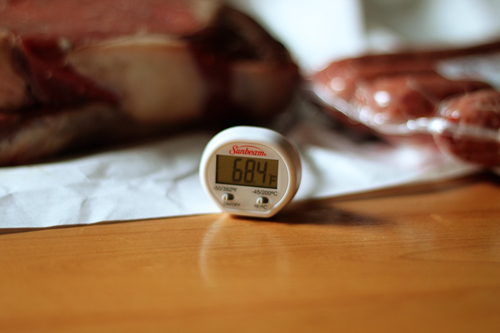 First off, a half hour longer cooking time at these temperatures is not going to mess anything up, so you can guestimate about 1 to 1½ hours per pound of meat. Use a fork instead of the thermometer. Stick it in the meat and twist. If it’s pull-apart tender, it’s done. You *can* overcook the meat on low and slow. It will start to break down and get mushy, which is never appetizing. A note on seafood: There are so many different kinds of fish, it’s hard to summarize. There are a few things to remember; in general, when the fish turns opaque and flakes easily, it’s done. Fish will take a lot less time to cook through than you think, so watch it carefully. Overcooked seafood is not really good for anything more than a dog/cat treat, so avoid it at all costs. There are 2 other thermometers I use regularly. 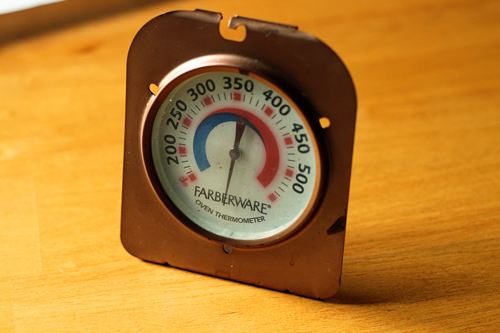 This is my candy/oil thermometer that I use for….well candy and oil. Nuff said. This is my oven temperature thermometer that I use to monitor the temperature of my oven for those sensitive baking items like cookies and breads. Nobody likes a burnt cookie except the dog. 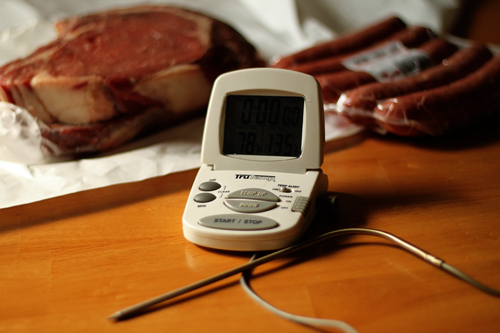 This is what we did with those steaks in the background of the thermometer pictures. I suppose I could file this as “Low Carb”, couldn’t I? I truly like the style of the web-site. I had a peek at your source code, hope you do not thoughts, to check what theme you are using. Is it it a no expense theme or do I have to purchase it?